Not to be confused with Wolfsville, Maryland. Wolfville is a Canadian town in the Annapolis Valley, Kings County, Nova Scotia, located about 100 kilometres (62 mi) northwest of the provincial capital, Halifax. The town is home to Acadia University and Landmark East School. Wolfville streetscape, spring 2006. 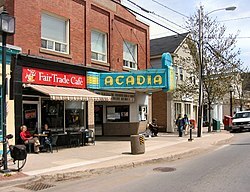 The view shows the Al Whittle (Acadia) Theatre, a house of movies and live performances now operated by a non-profit cooperative. The town is a popular tourist destination because of the scenery of the nearby Bay of Fundy and Gaspereau Valley, as well as for the many cultural attractions which are offered by the university and town. Among these is the Acadia Cinema Cooperative, a non-profit organization that runs the local movie/performance house. In the past few years, several Victorian houses in Wolfville have been converted to bed and breakfast establishments. From ancient times the area of Wolfville was a hunting ground for many First Nations peoples, including the Clovis, Laurentian, Bear River, and Shields Archaic groups. They were attracted by the salmon in the Gaspereau River and the agate stone at Cape Blomidon, with which they could make stone tools. Many centuries before European contact, Mi'kmaq people, related to the Algonquin and Ojibwe peoples, migrated into Nova Scotia. The Mi'kmaq were seasonal hunters, using dogs and traveling on webbed snowshoes to hunt deer. They used the various semi-precious stones (including jasper, quartz, and even amethyst) from the Blomidon area to make arrowheads. After an initial effort in 1604 by Pierre Dugua, Sieur de Mons and his cartographer Samuel de Champlain to establish a colony at Saint Croix Island, the colony was relocated to the Habitation at Port-Royal. The French and the Mi'kmaq quickly established a reciprocal trading relationship which continued to serve both peoples well until the mid eighteenth-century. The French found the area to be rich in furs and fine fertile land. Reports sent to France by individuals such as Samuel de Champlain, Marc Lescarbot and Nicolas Denys proclaimed the rich bounty to be found in the Annapolis Valley area. French settlement efforts continued in fits and starts. By 1636 under Charles de Menou d'Aulnay, Port Royal was reestablished after Acadia/Nova Scotia was transferred from England to the French under the Treaty of Saint-Germain-en-Laye. The progeny of these settlers, as well as the second wave of settlers under Hector d'Andigné de Grandfontaine, would eventually become known as the Acadians. By the late 1690s their population numbered about 350. French settlement in the Wolfville area began in about 1680, when Pierre Melanson established his family at Grand-Pré. The Acadians prospered as farmers by enclosing the estuarine salt marshes with dykes, and successfully converting the reclaimed lands into fertile fields for crops and pasturage. In 1710, however, Acadia was lost by the French crown after the English laid siege to Port Royal/Annapolis Royal. Under the 1713 Treaty of Utrecht, signed at the close of the War of the Spanish Succession, Acadia was ceded for the final time to the British. For the next thirty-six years, until the establishment of Halifax in 1749, the British remained at Annapolis Royal and Canso. The French-speaking Catholic population grew over the intervening years to well over 10,000 and the Minas region (Wolfville and environs) quickly became the principal settlement. Acadia was a borderland region between two empires, and this caused a complex socio-political environment to develop for the Acadians. Both the British and the French coaxed and threatened the Acadians in attempts to secure their loyalty as is evidenced by the various oaths of allegiance each side attempted to extract from them. This complex situation led many Acadians to attempt to maintain a neutral path; while others openly supported either the French or the British. During the War of the Austrian Succession, the Acadians in the Wolfville area were implicated in the Battle of Grand Pré, during which a French Canadian military force, reinforced by Mi'kmaq and Acadians, defeated a British force. With the onset of the Seven Years' War between Great Britain and France, the Acadians in the Wolfville area, along with all Acadians in peninsular Nova Scotia, suffered under the deportations that took place during the British Expulsion of the Acadians (see also the Bay of Fundy Campaign). Beginning in September 1755 and continuing into the fall, approximately 2,000 Acadians were deported from the area around Wolfville. The villages lying beyond Grand-Pré were burned by the British forces, and still more buildings were destroyed by both sides during the guerilla war that took place until 1758. Around 1760, the British government in Nova Scotia made several township plots of land available in the Annapolis Valley for colonization by English settlers. 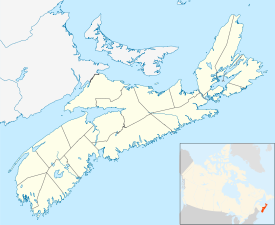 Horton Township was created in the Grand-Pré/Wolfville Area. Because of pressure on agricultural lands in New England, Anglophone farmers moved north in search of fertile land at a reasonable price. It is thought that between 1760 and 1789, more than 8,000 people known as New England Planters emigrated to the land around the Annapolis Valley. In 1763, there were 154 families living in the area of Horton Township. The New England Planters set up a primarily agricultural economy, exporting cattle, potatoes, and grain, and later apples, as well as developing lumbering and shipbuilding. They settled and re-used the same dyke-lands as the Acadians had used before them, repairing and later expanding the agricultural dykes. They developed a major expansion in 1808, the three-mile-long Wickwire Dyke, which connected the Wolfville and Grand Pre dykes. This allowed the agricultural development of an additional 8,000 acres. The town site for Horton was initially surveyed in the Grand-Pré area at Horton Landing near the mouth of the Gaspereau River. However, the town developed around the sheltered harbour on the Cornwallis River at Wolfville, at first known as Mud Creek. The first official record of a Baptist church in Canada was that of the Horton Baptist Church (now Wolfville), established on October 29, 1778. The church was established with the assistance of the New Light evangelist Henry Alline. The Baptist movement remained strong in the area. In 1838 Acadia University was founded as a Baptist college. In 1830, the town of Mud Creek changed its name to Wolfville, in honour of Elisha DeWolf, the town's postmaster at the time. In the mid-19th century, Wolfville was renowned as the world's smallest port. The town welcomed Confederation in 1867. The Windsor and Annapolis Railway arrived in 1868, later becoming the Dominion Atlantic Railway. Wolfville became a seaport devoted principally to the export of apples from the orchards of the fertile Annapolis Valley. Wolfville Harbour was also a terminus of the MV Kipawo ferry, the last of a long succession of ferries that connected Wolfville, Kingsport and Parrsboro for 200 years. The harbour, which empties twice a day due to the high tides of the Bay of Fundy, was once described by Robert Ripley as the smallest in the world. On March 20, 1893, the Town was incorporated, with Dr. E. Perry Bowles elected as its first mayor. In 1985, the town was declared a nuclear free zone. Wolfville was declared Canada's first fair trade town on April 17, 2007. In May 2016, Wolfville was designated as the third Cittaslow in Canada. In the 2016 Census of Population conducted by Statistics Canada, the Town of Wolfville recorded a population of 4,195 living in 1,972 of its 2,585 total private dwellings, a change of −1.7% from its 2011 population of 4,269. With a land area of 6.46 km2 (2.49 sq mi), it had a population density of 649.381649.4/km2 (1,681.8891,681.9/sq mi) in 2016. The Acadia University Art Gallery and The Festival Theatre are both located on Main Street, along with many bistros and boutiques. The town's history is presented at the Randall House Museum, operated by the Wolfville Historical Society. Each year, the Annapolis Valley Music Festival is held at Acadia Campus, where musicians from across the valley compete. Wolfville hosts two annual arts festivals, the Deep Roots Music Festival in September and Devour! The Food Film Fest in late October. Wolfville has a farmers market located in the DeWolfe building, a former apple packing warehouse. Eddy (M) Melanson was born in Wolfville, Nova Scotia, on July 25, 1938. ^ James Doyle Davison, ed. (1985). Mud Creek: The Story of the Town of Wolfville, Nova Scotia. Wolfville, N.S. : Wolfville Historical Society. ^ Jonathan Fowler. The Neutral French of Mi'kma'ki: An Archaeology of Acadian Identities Prior to 1755. University of Oxford, 2009. ^ Charles Morris. "A Brief Survey of Nova Scotia". The Royal Artillery Regimental Library, Woolwich, UK. ^ "Full Circle: History of the Kipawo". The Downhomer. August 1995. Archived from the original on September 28, 2007. ^ "An alternative economic model". CBC News. April 23, 2007. ^ "Census 1956-1961" (PDF). 6.statcan.gc.ca. June 9, 2009. Retrieved September 1, 2017. ^ "I:\ecstats\Agency\BRIAN\census2" (PDF). Archived from the original (PDF) on October 5, 2013. Retrieved September 1, 2017. ^ "www12.statcan.gc.ca". www12.statcan.gc.ca. Retrieved September 1, 2017. Wikimedia Commons has media related to Wolfville. Wikivoyage has a travel guide for Wolfville.